The crowds of street style stars and photographers outside the fashion month shows have been even bigger than ever. However, there is one team that I always look out for in any street style roundup. Net-a-Porter's buying team attends the shows to decide what they will invest in for next season, meaning they have a huge influence over what we will all be wearing in six months' time. It's not surprising then that their own outfits are seriously enviable. Fashion Director Lisa Aiken is a favorite with the street style photographers, while her fashion week wingwoman Holly Russell, buying manager of ready-to-wear, and Elizabeth von der Goltz, newly appointed global buying director, have given us outfit envy on an almost-daily basis. They have access to some of the most in-demand designer pieces, from Calvin Klein's cutout sweater to The Row's circle handbags. However, their styling is approachable, with styling tips we can all wear outside of the fashion week street style bubble. Keep scrolling to shop 11 of our favorite items they have worn this month. 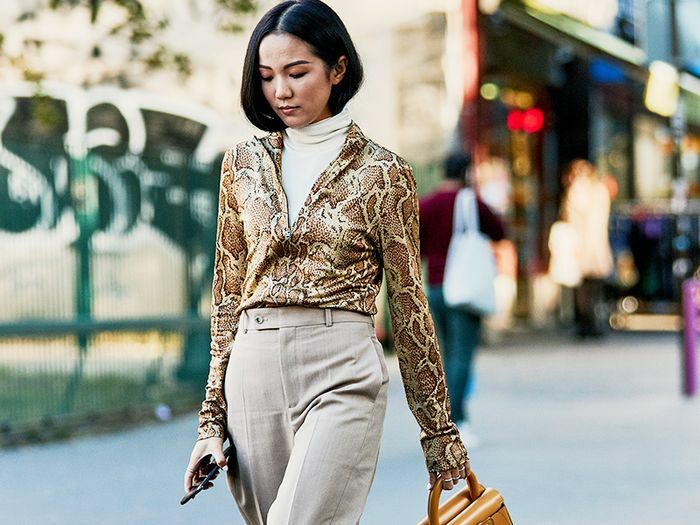 Style Notes: Net-a-Porter's buyers are clearly in sync when it comes to trends, as Lisa, Holly, and Elizabeth show how to do suiting in three different ways. The one item that we want the most, however, is the postbox red Nico Giana handbag. Style Notes: Another day where the Net buyers got the same suiting memo—Lisa wears a checked Joseph cropped trouser suit; meanwhile, Holly opts for a red flared Gabriela Hearst suit. Style Notes: When it comes to styling a trouser suit, Holly makes her double-breasted red version more day-appropriate by pairing it with an AC/DC vintage band T-shirt. Style Notes: Lisa updated the blue jean + white T-shirt + trench combo with a bright red sweeping coat and white pumps. Notice she's wearing one of the biggest surprise accessories of the season—a sparkly anklet. Style Notes: If we had to pick one bag that was the talk of fashion month, it would have to be Gucci's quilted belt bag—to be styled over coats and jackets like Holly does here. Style Notes: This look includes two of this season's most sought-after accessories: Balenciaga's satin pumps and The Row's double circle bag. Style Notes: All of Net's buyers have worn white boots at least once this fashion month. Style Notes: Lisa Aiken's DVF dress has been one of the most popular items on the front row so far this season. Style Notes: This combo, including a denim midi skirt, a Gucci belt, and white mules, is perfect for Sunday brunch—just add a chunky knit to make it more October-appropriate. Style Notes: Holly shows that the coolest way to wear dresses right now is layered over jeans and a T-shirt, as she pairs her velvet Attico wrap dress over her Re/Done jeans. Style Notes: This Calvin Klein jumper with color-contrasting sleeves that's giving the appearance of arm warmers might be divisive, but it has been a real hit with the street style crowd this month. Holly styles it in a simple way with a gray checked miniskirt, showing that it's more wearable than you might think. Next up, get to know Victoria's Secret Angel Jasmine Tookes a bit better as she spills her fashion firsts.